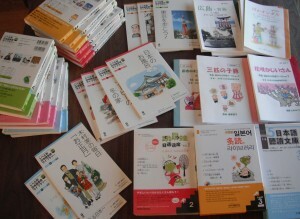 NPO Tadoku Supporters proposes and propagates tadoku to people acquiring or teaching the Japanese language. And in Japan,’globalisation’ has brought an increasing number of people from abroad in recent years, and the language barrier has become more serious as more children arrive in Japan with their parents and more Japanese children grow up in and return from outside Japan. Japanese has a complex writing system with kanji, hiragana and katakana, which usually present a quite a hard obstacle to overcome. That is where the Tadoku Supporters comes in; to pave the way by creating graded readers for learners of Japanese. The aim is to present them with books that are fun and easy to read so that they want to read more and more, resulting in tadoku or ‘quantity reading’, which is expected to improve their Japanese skills in general. Regarding the English language, there are a huge number of very easy reading materials, and tadoku have helped many Japanese to read books in English fluently and enjoy them thoroughly. We hope the learners of Japanese around the world will find a lot of fun and use in Japanese tadoku readers, and will eventually help us help more people enjoy learning and using Japanese. With any luck, we might be able to create and build a multicultural world community! An Invitation to Japanese Language Classes!